brider's place: New Balance Minimus Road... WIDE! As I stated in my last post, my wife and I stopped by the Born to Run store in Bellevue, WA, last Saturday. I tried on several pairs of shoes. A little about the Born to Run store: This store is a minimalist runners go-to place for low- to no-drop, lightweight, and sometimes a little goofy shoes. Merrel Barefoots, Vivobarefoot, and Vibram FiveFingers are prevalent. 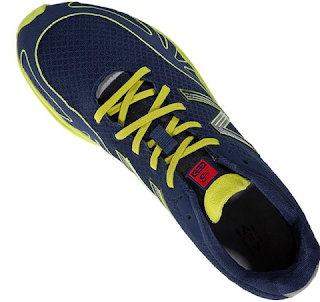 They also have several other lines including offerings from New Balance, Inov-8, and Altra. I had tried on the Minimus Trail and Minimus Road when they first came out. As is the case with many shoes, I really like several of the things going on with it: low 4mm heel drop, light weight. I already had Merrell Trail Gloves, so the Minimus Trail wasn't really on my radar screen for purchase. The Minimus Road, though, offered some cushioning in the way of a firm EVA midsole, and the under-cut heel, much better for road running (for me). Holding the shoe in my hand, I really wanted this shoe to work for me. And then I slipped it on my foot. The rearfoot felt much like the most comfortable of racing flats I'd ever had, flexible where is should be, not harsh at the collar, lacing up snugly without having to cramp up the arch. The forefoot, though, is where things fell apart. Similar to the issues I have with the Kinvara, the shape of the toe box just wasn't working for me. I know they say the toe box on the Minimus is wider than normal, and that may be true, but the TAPER of the toe box is what killed it -- the inward taper at the little toes came too early, and combined with taper at the bog toe, it just pressed my toes together. I NEED TOE SPLAY SPACE! These may work for Tony Krupika (who was instrumental in the design of the shoe), but apparently he has a foot shape different from mine. I heard that New Balance was coming out with a wide (2E) version of the Minimus Road, and looked forward to being able to try them on. I've had decent luck with "formal" shoes, going wide, as long as the heel isn't significantly wider than the standard D width. I hoped that the Minimus wides wouldn't have a wide heel as well. The day I'd stopped at Road Runner Sports and tried on the Brooks PureProject line, I'd asked if they had the wide model. Nope. BUT...! When I asked at the Born to Run store, they said that the only New Balance Minimus shoes they have are the wides. Um... really? Let me at 'em! So I slipped on the Minimus Road 2E width, and I have to say that it eliminated EVERY complaint I had with the D width model. My toes had plenty of room to splay, and I didn't have to cinch up the laces any more than the standard to get the rearfoot to fit correctly. It seems that the width was added in all the right places -- along the lateral edge of the toe box. I trotted around the store a few times with them on, and they felt unobtrusive, light, and firm underfoot. So a shoe that I had written off some time ago is back on my "to do" list. It'll wait a little while before I add them to my shoe rotation, as my "shoe and race" account needs to build up a bit after adding the Skechers GoRun so recently. If any one out there has written off the New Balance Minimus Road due to the forefoot, I'd suggest taking a look at the wide model. It may well remedy what was ailing about the standard width model. Sweetness! Thanks for confirming this David! I may give them a shot now.